Whenever I get a new computer, my biggest problem is migrating all my old stuff to my new machine. 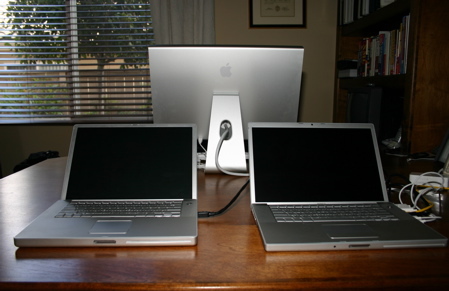 Usually, I just use Carbon Copy Cloner to mirror the old hard drive to the new one, but that won’t work since I’m moving from a PowerBook with a PPC processor to a MacBook Pro with an Intel processor (my PPC version of Mac OS X is not Universal). Of course, Apple has already solved this migration problem for me. The first time I turned on the new MacBook Pro, it asked me if I wanted to move my data from another Mac. I simply connected the computers using FireWire and everything was moved to the new computer including my home folder, preferences, apps, and network settings. There was one minor exception: I had to manually install Apple’s developer tools since that folder isn’t kept with the regular applications. Disclaimer: I’ve worked for Apple for eight years. Not only had I never used a Mac before coming to Apple, but for my first three and a half years at the company I only worked on Windows NT and Windows 2000 on a daily basis.